Insadong street, located in the heart of Seoul is an important place where old but precious and traditional goods are on display. There is one main road in Insa-dong with alleys on each side. Within these alleys are galleries and traditional restaurants, teahouses, and more. 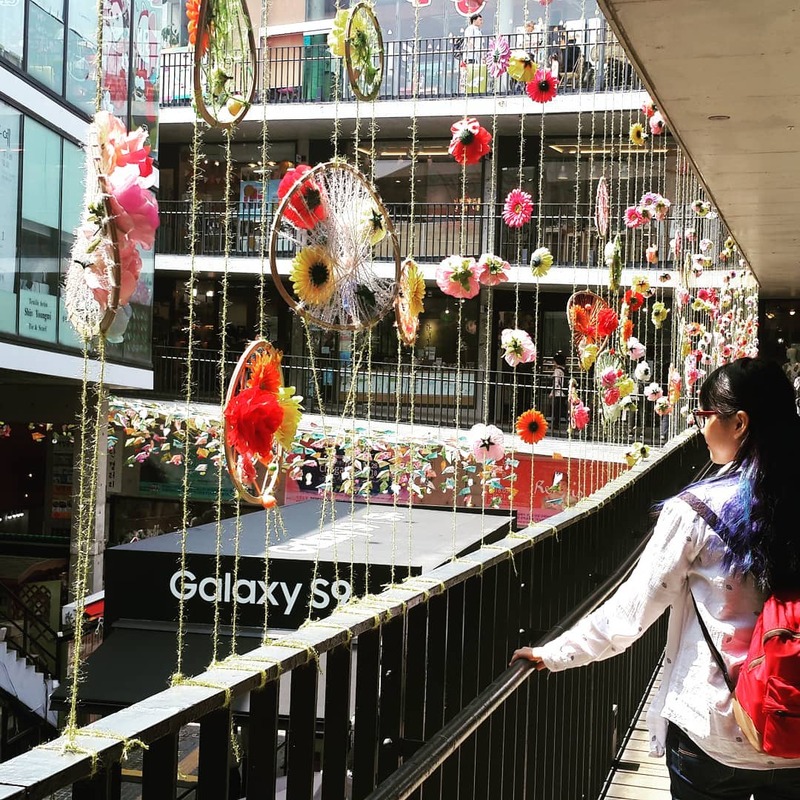 Insadong street is a must-go destination for all tourists visiting Seoul for the first time and there are so amazing things to do in Seoul you can find here. It is known for its extensive array of shops and restaurants. There are also loads of others things to do and see in the area. 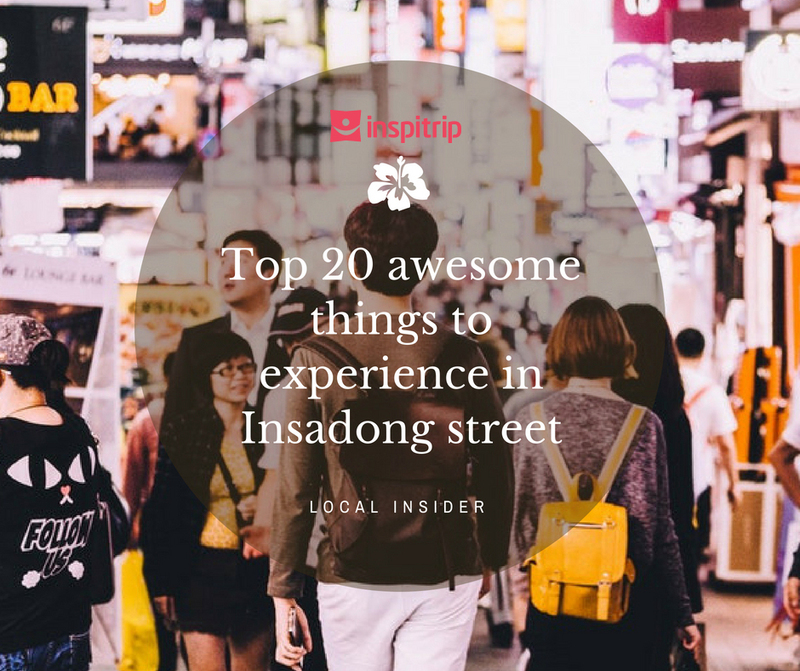 Here are our 20 awesome things to experience in Insadong street. 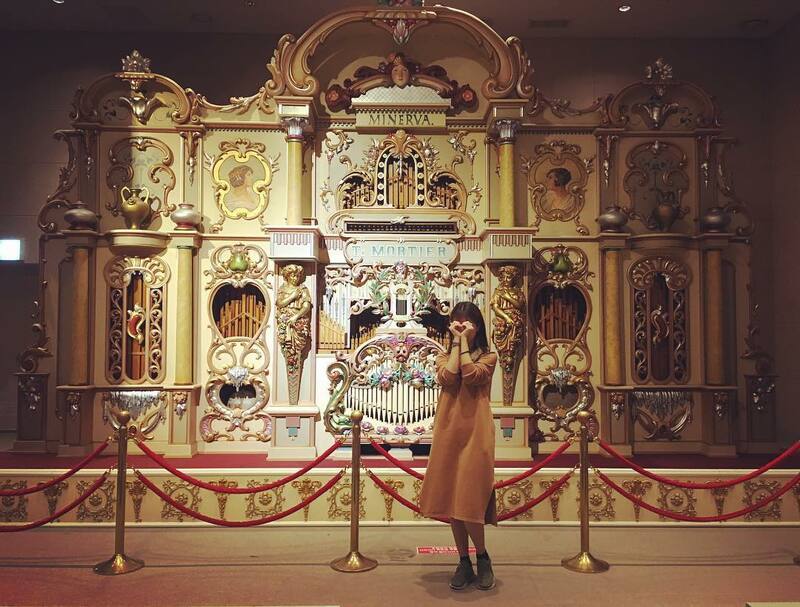 Following the lead of the popular “trick-eye” museums, the quirky Alive Museum opened to great fanfare in 2014. Like all of its brethren, including the similar Trick-Eye Museum in Hongdae, The Alive Museum uses parallax effects and other optical illusions to draw visitors into its outlandish scenes. With over one hundred exhibitions in the Alive Museum, you’ll insert yourself into artwork that tackles everything from getting chomped on by Marilyn Monroe to boxing a kangaroo. If you want to get a little extra action in, combine your visit to the Alive Museum with the Dynamic Maze, an interactive and challenging obstacle course that’ll test both your mind and body. 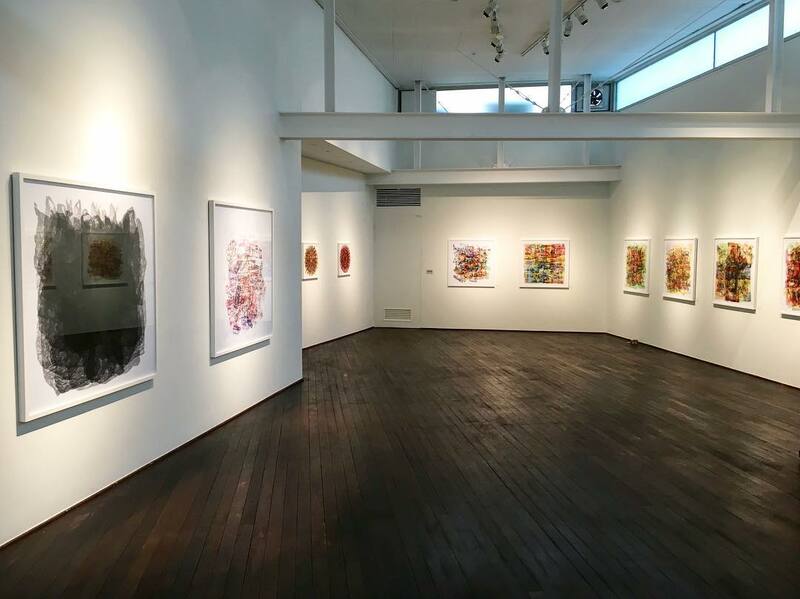 As the art capital of Seoul, it would be a crime to miss Insadong’s galleries that showcase a wide variety of traditional and contemporary art. Many of the neighborhood’s galleries are completely free to explore so be sure to dedicate at least an hour to browse a few exhibits. Gana Art Space is one of the better known cultural spaces in the neighborhood and is a breeding ground for up-and-coming artists emerging on the scene. Stationed inside a beautiful hanok (traditional wooden Korean house). The Beautiful Tea Museum shows off everything tea-related from ceramic teacups & saucers to exhibits detailing tea traditions from various countries in Asia. Once you’ve traveled around the world of tea, plop down and relax at the on-site café where you can choose to sip 130 different teas from Korea, China, Tibet, Japan, India, Sri Lanka and more. From green & black teas to herbal & flower teas, the Beautiful Tea Museum covers flavors for every palate. 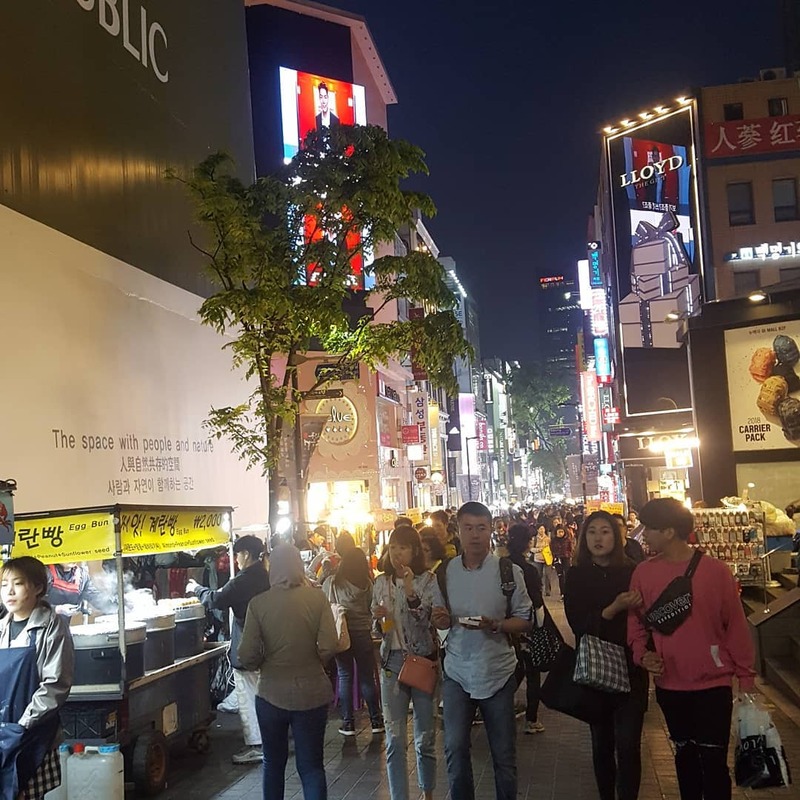 For shoppers looking for a break from the brand-heavy streets of Myeongdong, Insadong’s best shopping destination, Ssamziegil lies in wait. Famous for its unique spiraling outdoor courtyard walkway, Sssamzie-gil is home to over 70 stores where you’ll get to drop your won on everything from handmade goods to yummy Korean food. Although fresh-faced having opened in 2004, Ssamziegil blends surprisingly well with the neighborhood’s traditional aesthetic and spirit. Many of Ssamzie-gil’s best finds are unique to Insadong, handcrafted by local artisans in the complex’s own workshops and galleries. While visiting Ssamzie-gil, don’t miss out on visiting the Sky Garden on the 4th-floor rooftop for cool sweeping vistas over Insadong. 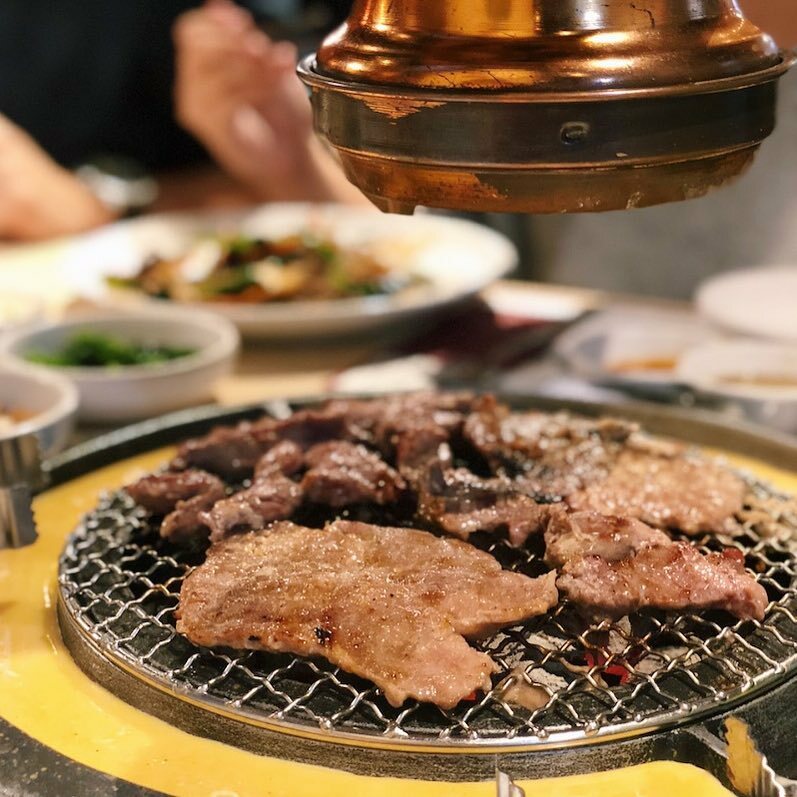 Korean BBQ places are a popular option for eating out in Korea. Not only do they serve delicious food but are spots for the meeting, chatting and drinking. Insadong is home to many such places, given its traditional past. One popular restaurant is Cha Iyagi, which literally means ‘tea story’. 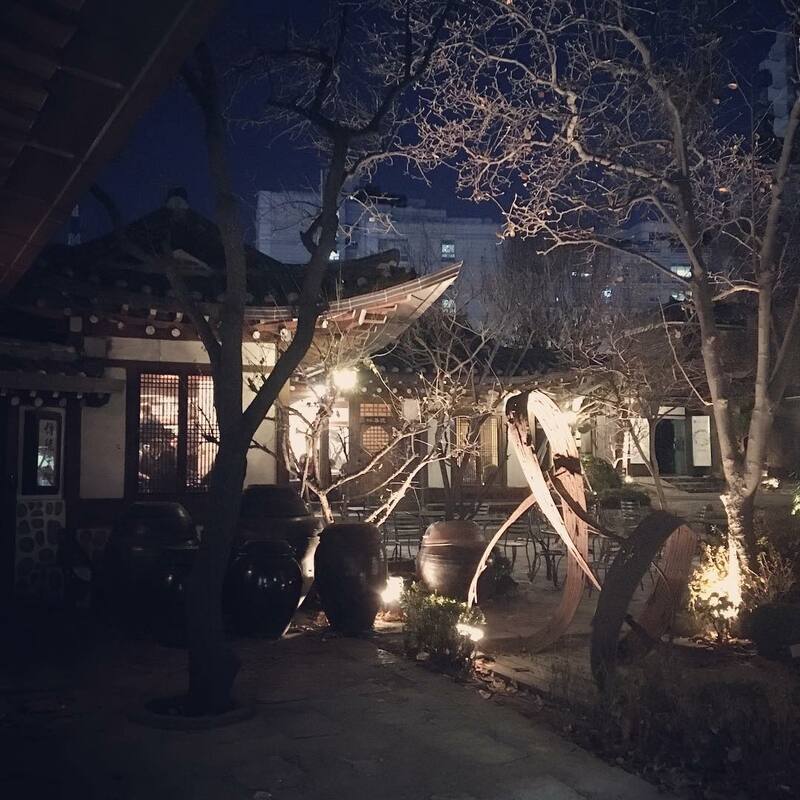 The interior looks like the inside of a hanok (a traditional Korean house) and the food is delicious. Sure, it can be plenty of fun walking on Insadong’s main street, but wait until you venture into the hidden alleys. 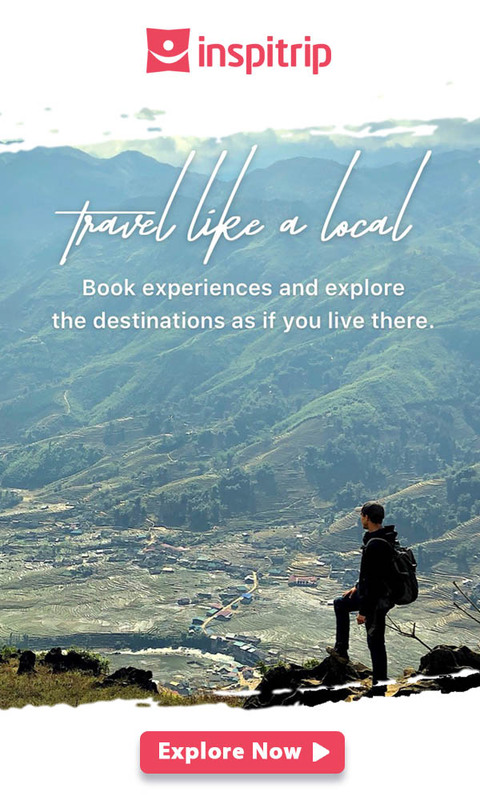 From traditional tea houses to affordable Korean food to makeolli drinking, you’ll want to come back again and again to try every hidden gem. These alleys may get busy during lunch hours but make for a meditative stroll when the calm sets back in. Chefs lay out their ingredients to dry under the sun while cats take a nap like it’s a lazy Sunday afternoon. The first modern urban park in Seoul – Tapgol Park remains one of the most important sites in the city with a trove of historical monuments. 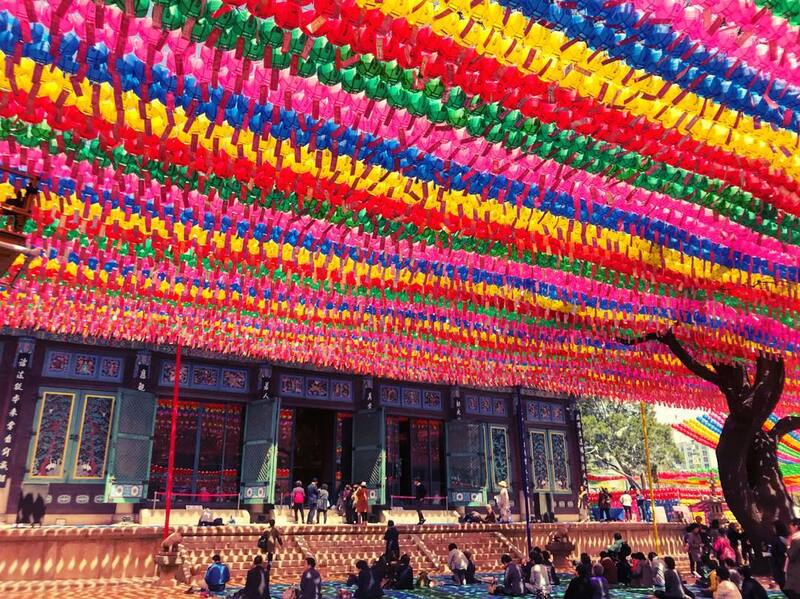 The centerpiece of the Tapgol Park, Wongaksa Pagoda, dates back to 1467 when the area was set within the grounds of the Jogye Order of Korean Buddhism’s most important temple. This ten-level stone pagoda – responsible for the park’s old name, Pagoda Park – is the only remnant from the 15th-century Wongaksa Temple, making it all the more important as a Korean cultural relic. Much later in the country’s history, during the 20th century, Tapgol Park set the stage for Korea’s independence. It was here that resisters first read the Korean Declaration of Independence, setting into motion the bloody days of the March 1st Movement. Few Insadong attractions capture the area’s artistic vibe better than the Kyung-in Museum of Fine Art, Opening in 1983, the Kyung-in Museum of Fine Arts showcases the work of local artists and sculptors through its five exhibition halls & galleries. Aside from the actual exhibits at the Kyung-in Museum of Fine Art, the museum’s architecture is, on its own, quite impressive. Throughout the complex, natural light and well-manicured flora blend with both modern and traditional elements to create a beautiful environment. Get a taste of North Korean style dumplings at Gung, a family-run restaurant owned by a kindred grandmother who escaped the North during the Korean War. The Gaesong mandu, stuffed with ground pork, Chinese cabbage, and pumpkin, is served perfectly steamed and packs a lot of flavor into each bite. 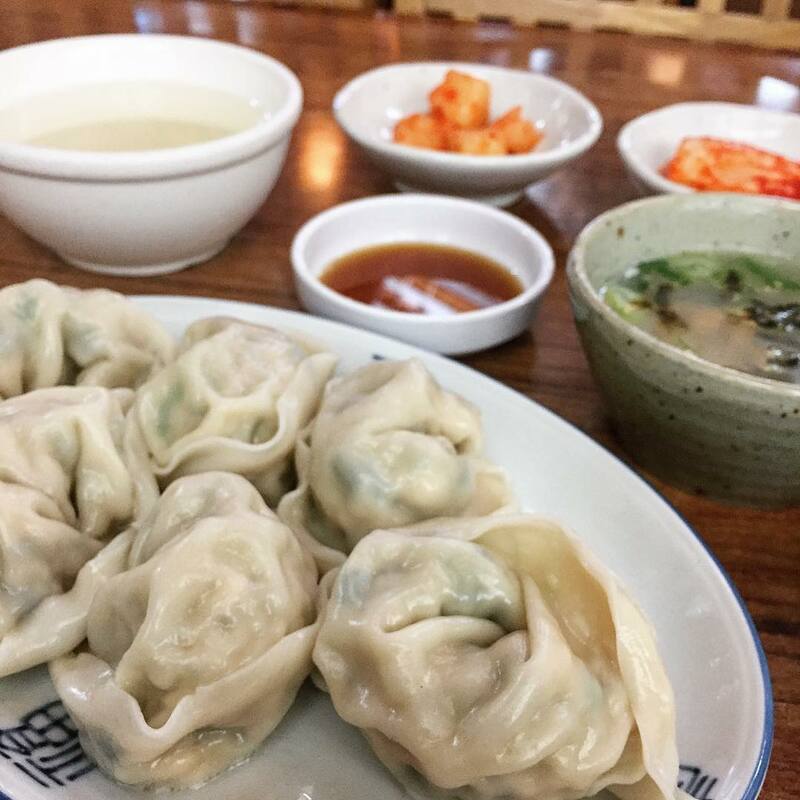 The dumplings, which are bigger and rounder than the South Korean version, pair well with the restaurant’s bossam, or tender boiled pork slices in lettuce wraps, and kimchi, which is made fresh in front of the restaurant throughout the week. At the Insadong Tourist Information Center, you can try on a hanbok for a small price. 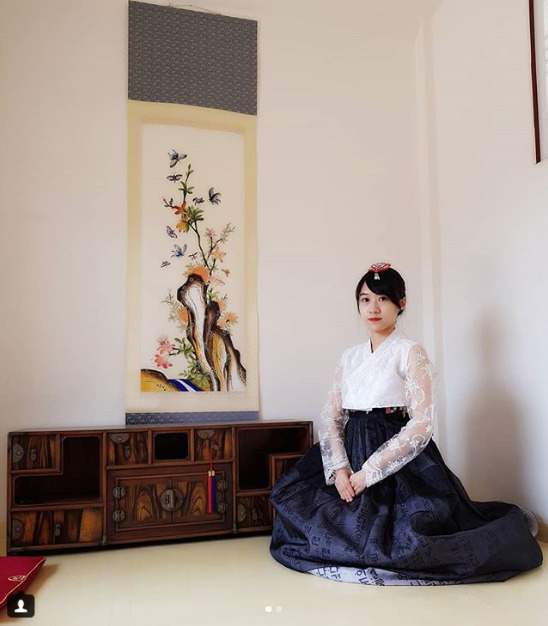 A hanbok is a traditional Korean piece of clothing worn since the Joseon era. They have a variety of colors and styles of hanboks for men, women, and children. Even though this was clothing worn by Koreans throughout history, actual hanboks now cost upwards of $500! Gyeonghuigung Palace was built using the slanted geography of the surrounding mountain, and it boasts traditional beauty in its architecture and huge historical significance. For a time, it was of a considerable size, even to the point of having an arched bridge connecting it to Deoksugung Palace. 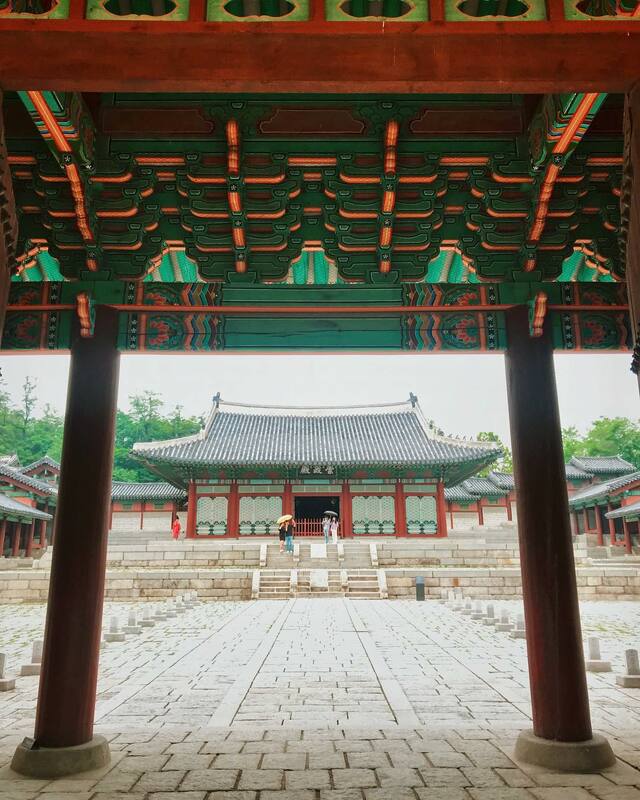 For the king’s royal audience, there were Sungjeongjeon and Jajeongjeon buildings, and for sleeping quarters, Yungbokjeon and Hoesangjeon buildings. Altogether there were about 100 small and large buildings on the palace grounds. Currently, Gyeonghuigung’s front gate, Heunghwamun, is being used as a front gate for Shilla Hotel’s main entrance, and Sungjeongjeon is at Dongguk University. The school moved out to a different area, and the Sungjeongjeon and some of the other buildings have been reconstructed. 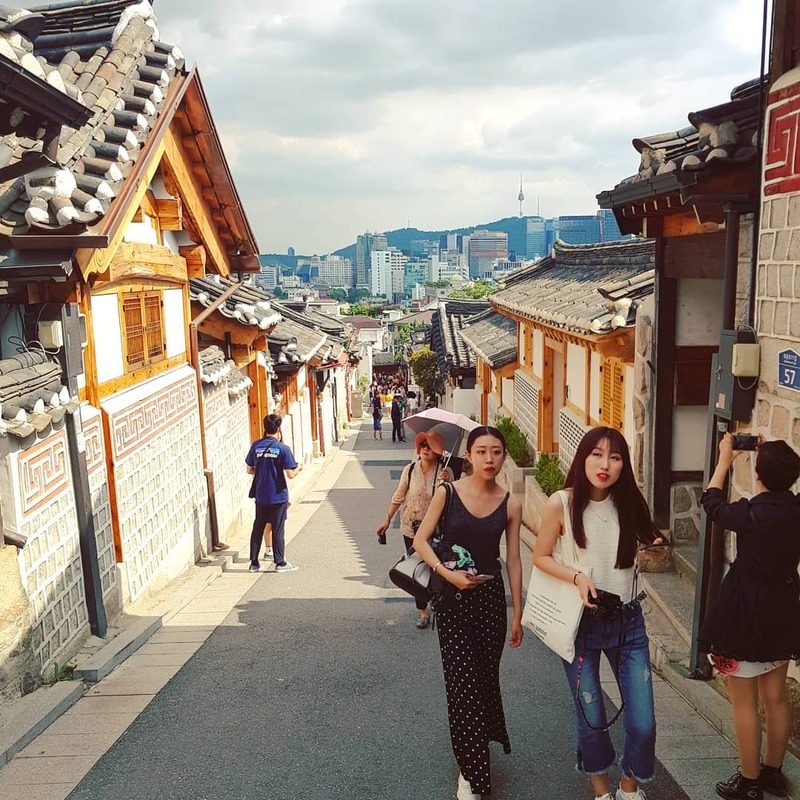 From Insadong, make your way to Bukchon Hanok, a traditional village in Seoul with a long history. 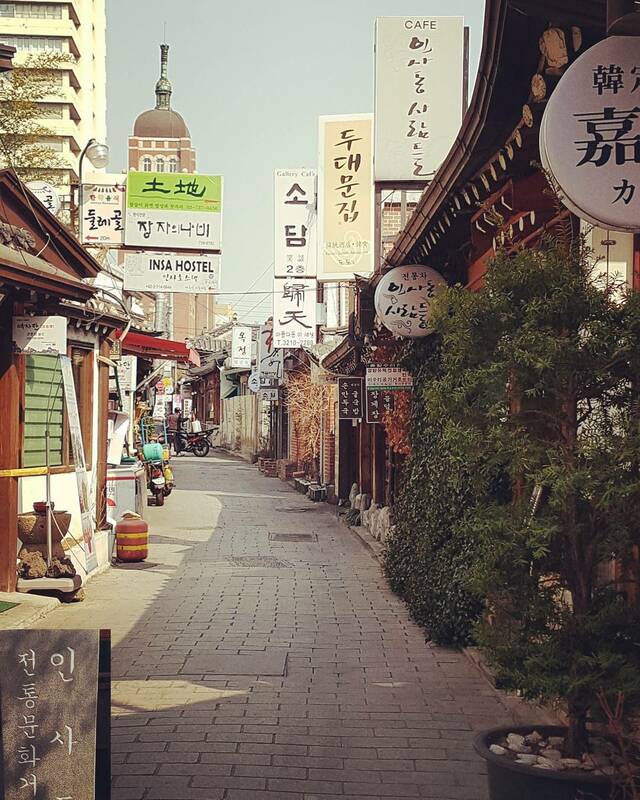 The traditional village consists of lots of alleys, hanok. It is preserved to show a 600-year-old urban environment. 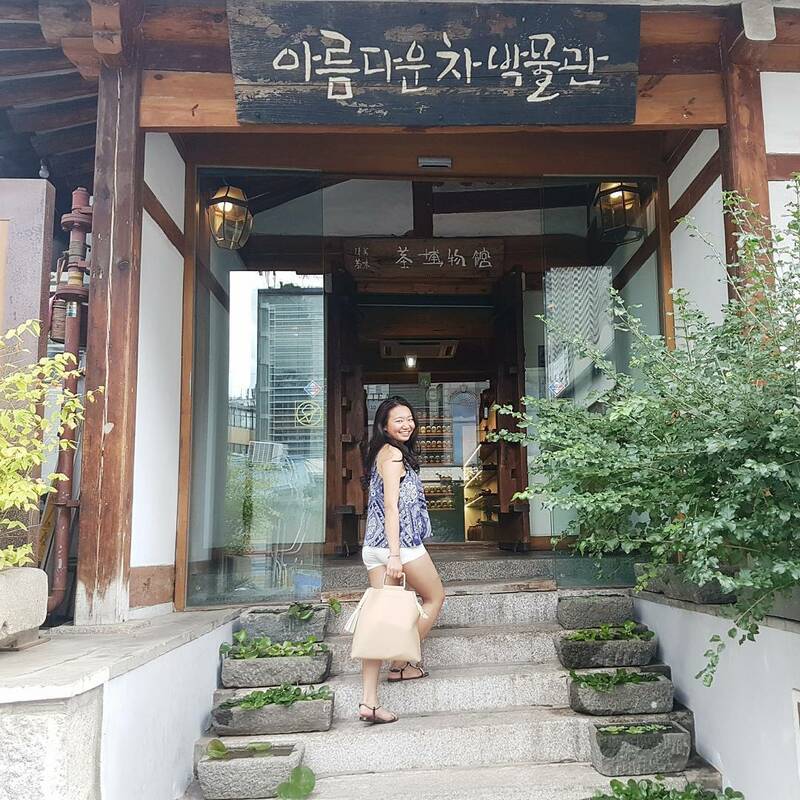 Now it is used as a traditional culture center and hanok restaurant, allowing visitors to experience the atmosphere of the Joseon Dynasty. Bukchon Hanok Village is a fascinating collection of restaurants, tea houses, cultural centers and more providing visitors with a rich Korean traditional culture experience. The Shin Old Tea House is hidden in an alleyway, away from the main hustle and bustle of the area. 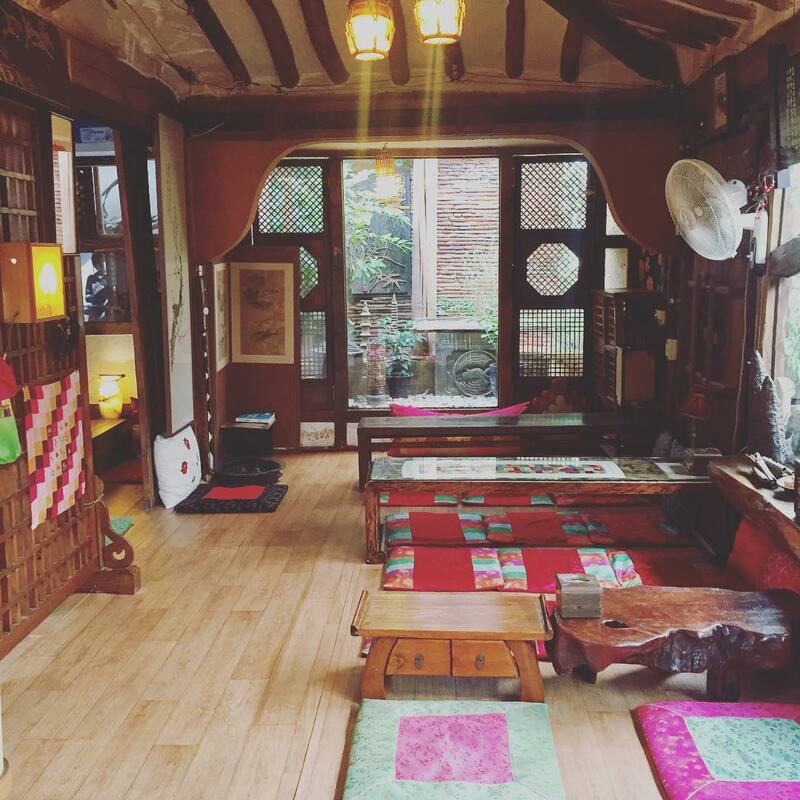 It’s small and only provides floor seating like a traditional Korean tea house. The lighting is dim and provides a very relaxing aura, while the tea list is extensive and boasts some fantastic regional specialties. It serves nearly a couple dozen varieties of Korean tea, ranging from hot ginger tea that warms the soul to fruity iced teas that offer a refreshing escape from Seoul’s blistering summer heat. Along with quenching your thirst, beverages come with tasty stick-to-your-ribs snacks like sticky Korean rice cakes. 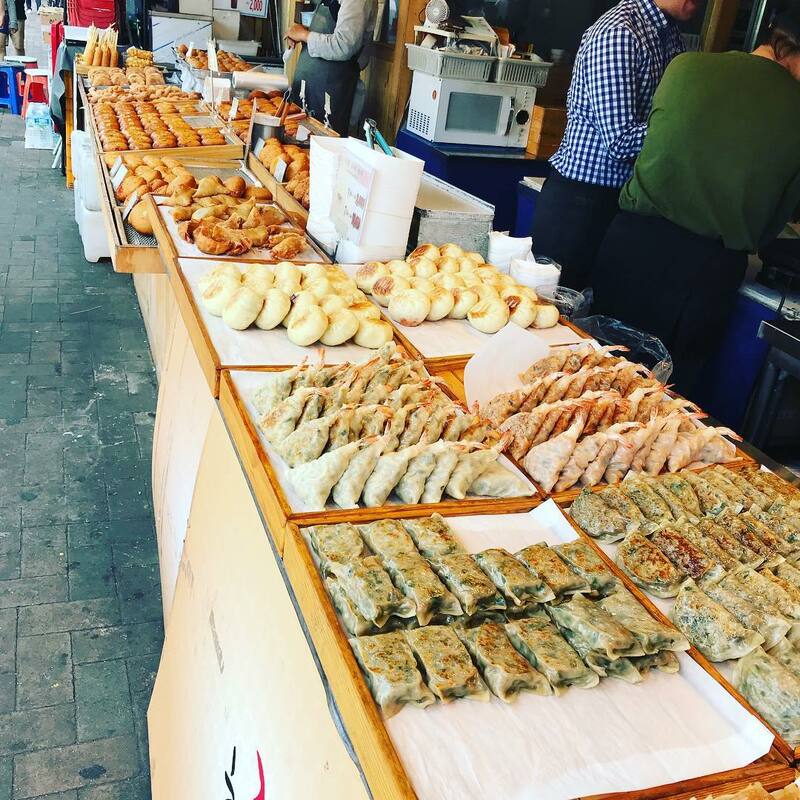 Insadong has some of the tastiest food vendors in all of Seoul. One of the main attractions in the area is the ‘Kings Dessert’ or the ‘Dragon’s Beard Candy’, 16,000 strings of honey wrapped multiple times with a flavoring of either almond, peanut or chocolate on the inside. Another popular street food is the corn cookie, which isn’t actually a cookie but a twisty ice cream cone with sweet fillings. There are also gooey pancakes and spicy Korean dumplings to sample. 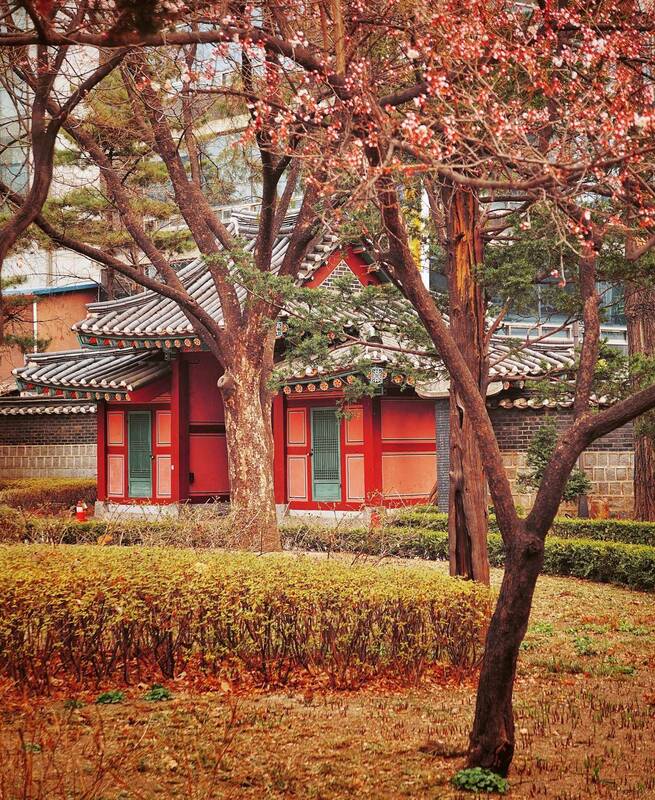 Changdeokgung Palace was the second royal villa built following the construction of Gyeongbukgung Palace in 1405. It was the principal palace for many kings of the Joseon Dynasty and is the most well-preserved of the five remaining royal Joseon palaces. The palace grounds are comprised of a public palace area, a royal family residence building, and the rear garden. Known as a place of rest for the kings, the rear garden boasts a gigantic tree that is over 300 years old, a small pond and a pavilion. Though it has been treasured by Koreans for centuries, Changdeokgung Palace was recognized as a World Cultural Heritage site by the UNESCO World Cultural Heritage Committee in December of 1997. 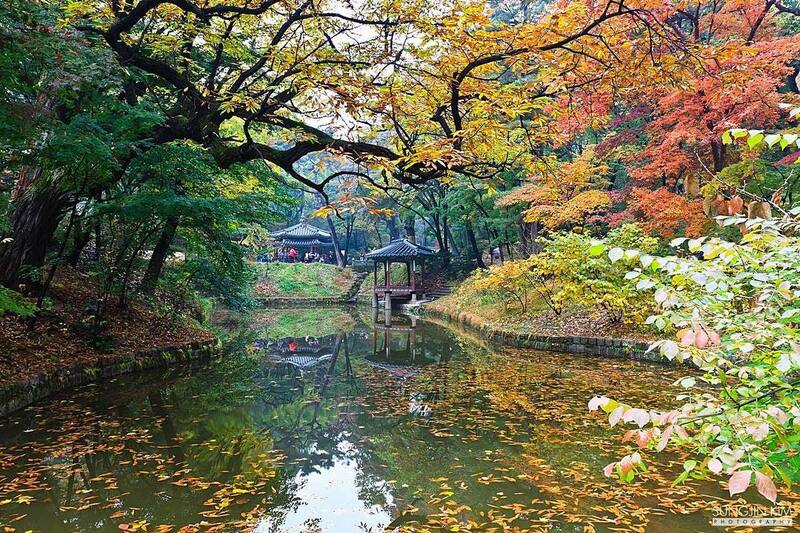 It is one of the most historically significant attractions that represent the beauty of Korea. 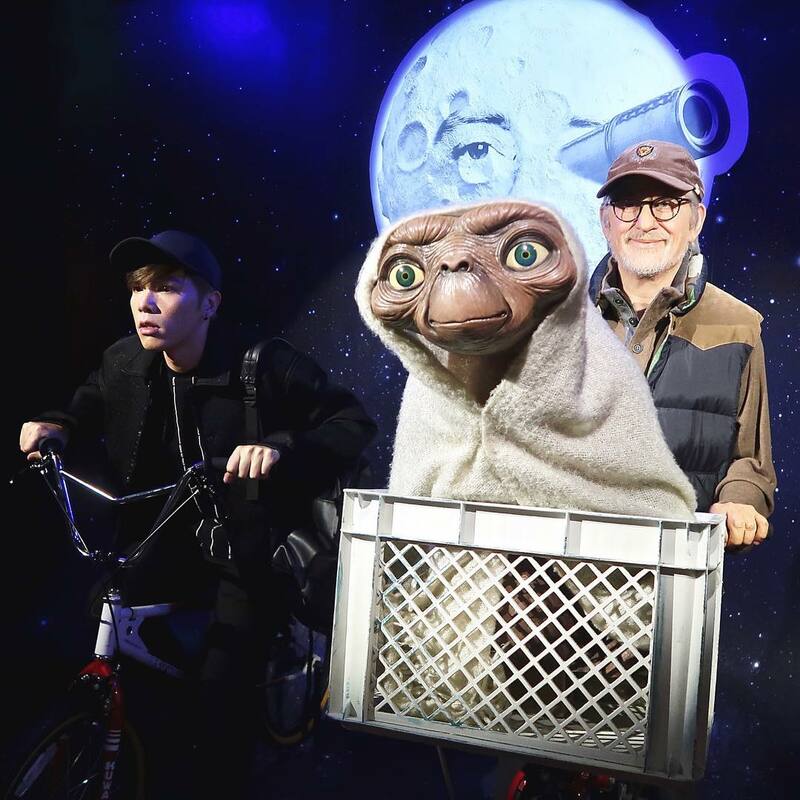 France’s famous wax museum, the Musee Grevin, opens its fourth venue in Seoul, after its opening in Paris, Montreal, and Prague. The first Asian subsidiary is adding a slew of South Korean Hallyu celebrities like Psy, and G-dragon as well as figure skating star Kim Yuna. Over 80 wax figures are presented in different themed spaces, including historical figures such as King Sejong and General Yi Sun-sin. Cheonggye Plaza is a plaza located at the starting point of Cheonggyecheon Stream. It is not located in Insa-dong but you can walk along the stream towards here. There is a mini waterfall here which was lit up beautifully when we visited at night. The Spring Sculpture is the centerpiece of the plaza. 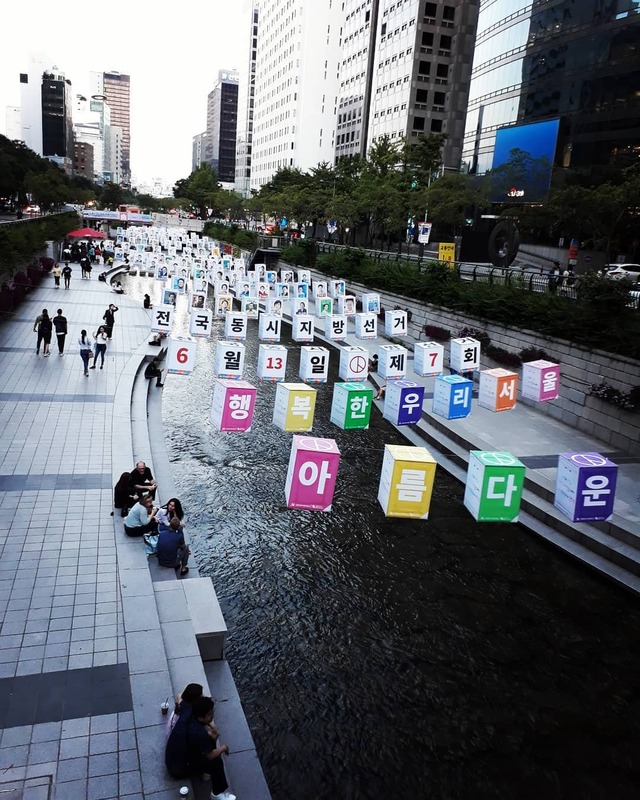 It is a symbol for the restoration of Cheonggyecheon Stream in 2005. The blue and red stripe design is inspired by the Korean clothing design known as bojagi. The Korean restored the old waterway in 2005. The stream stretches over 10km, but we only walked along it for a short distance. It passes by many famous landmarks, such as the Seoul Plaza, Insa-dong Street, Changdeokgung Palace and Deoksugung Palace. Here you can see many folk paintings on the waterway side walls, depicting the history and livelihoods of ancient Koreans. 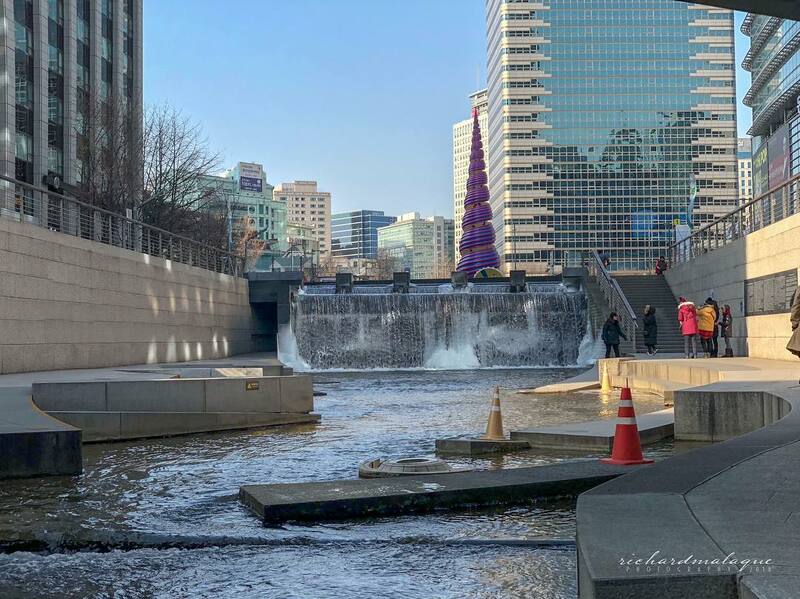 No visit to Seoul would be complete without walking along the Cheonggyecheon Stream. You may also impressed with the beautiful landscaping of the waterway. At night, the lights made Cheonggyecheon Stream a pretty sight to behold! Last but definitely not least, we will have an enjoyable time just walking along the streets of Insa-dong. At night, the streets are colorful and bustling and you will enjoy the vibe. We recommend spending at least one hour here exploring the alleyways; there are so many artisan shops and cafes that you never know what you might find!